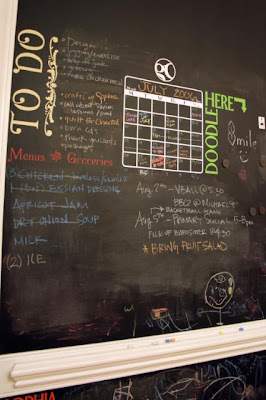 My Sweet Savannah: Get crazy with chalkboard paint! 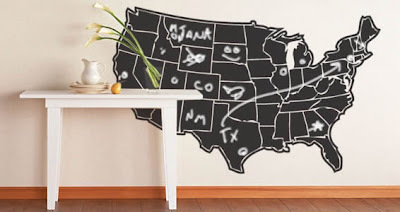 Get crazy with chalkboard paint! 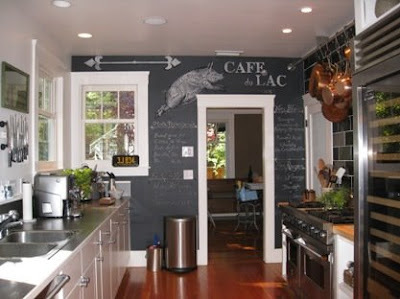 I can't get enough of chalkboard paint. 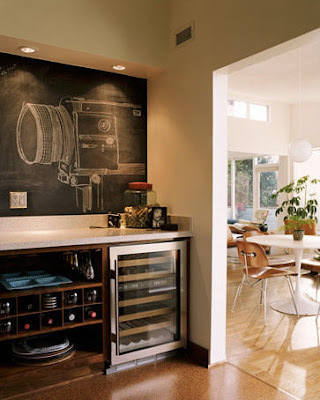 I have always wanted to do a whole wall in my kitchen, and after seeing these photos, I just may! It's a little intimidating at first, but after all, it is just paint, if you don't like it, paint over it! 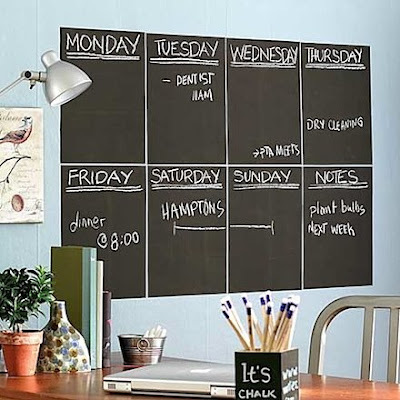 Get really crafty and add a magnetic paint underneath your chalkboard paint! 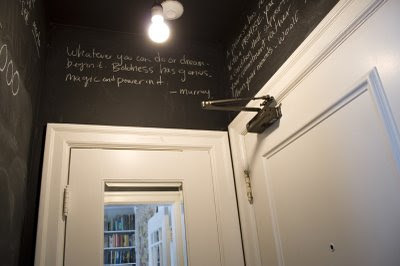 I have a door in my kitchen painted with chalkboard paint and I love it! The kids love it too! It's very handy for jotting down grocery lists. 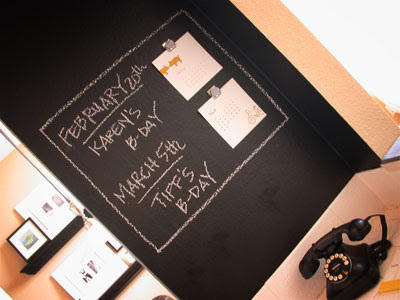 I love the idea of combining a wall graffiti, like this calendar, with the chalkboard! Very clever! This is way to cool......how about this in a child's playroom? A little educational art. 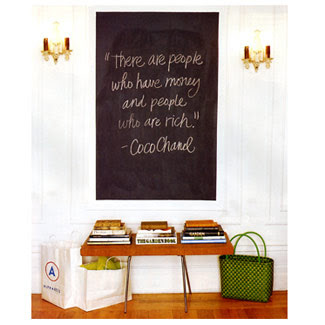 Check out etsy for some great chalkboard ideas and products! This is just plain gorgeous. Love it up against the brick. Here is what I want to do! The wall that separates the kitchen from my dining/family room. I don't think mine would look this neat! 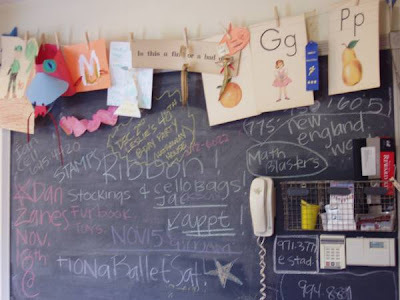 This is another clever idea layering a vintage metal basket and paper goods on a clothesline! 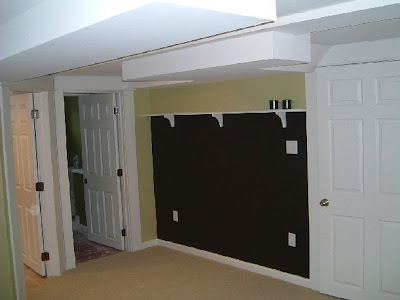 Great craft room or play room idea! Love this for a message center. You can change your border as often as you like! I like the ledge on this one. It looks very dark when you first paint it on. But, after you write on it several times and erase it, it really takes on a nice look! How about a quote of the day? and oh, yet another inspiration photo for my kitchen! Great for a study or office. No more paper waste. This is clever, although you would probably have to haul a ladder out every time you wanted to change it. And, the best for last. 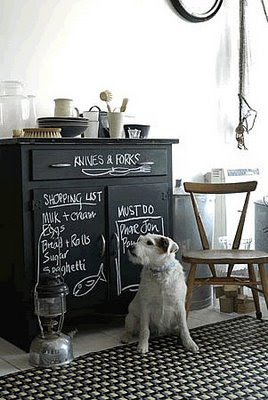 Transform an old garage sale or flea market cabinet with chalkboard paint! Your husband will never have to ask, "where do we keep the........" ever again! Another cute idea would be on a child's dresser. I'd love to see what you have done with this great stuff! Send any pictures my way! I say go for it! I have always wanted to do it too, but I can't find a good spot. One of my Girlfriends did a wall outside her kitchen a added a large empty white Ikea frame in the middle and it looks so great and her 4 yearold daughter loves it too. How fun!!!! 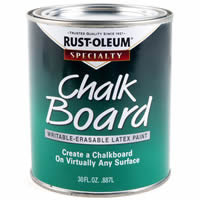 I love chalkboard paint too!!!! Great ideas....I would definately do the pig!!! Love those pictures! 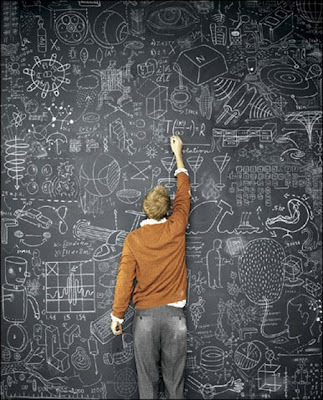 I've not been brave enough to paint on a wall yet, but am in LOVE with chalkboard paint on lots of other surfaces! 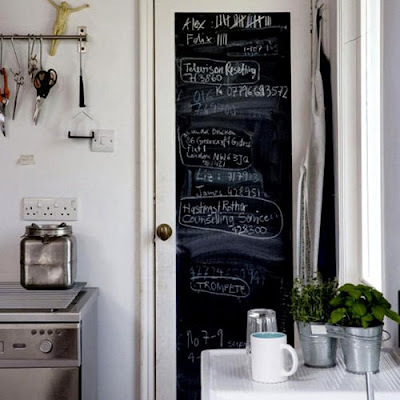 In fact, today's Trash to Treasure post features chalkboard paint! Check it out if you get a chance. 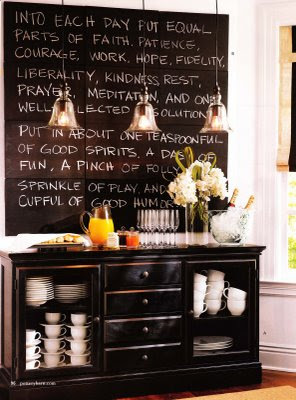 I love the idea of chalkboard paint. I have wanted to paint a wall in my kitchen area too, but my husband wasn't so sure. Instead, I created a chalkboard out of a large old window frame.I have really enjoyed it. By the way I love your blog! Thanks for all of the inspiring photos and ideas. Go for it! 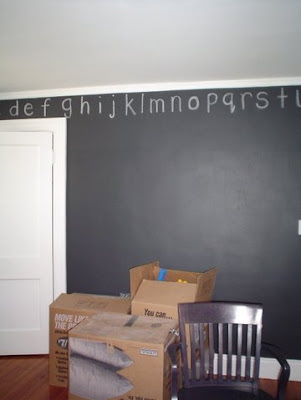 I did this in our last house in the kids' playroom - they loved it! It was a great addition to the room. LOVE the pictures!! That pig is great!! We just painted a small wall in our kitchen with chalkboard paint and I love it... it's actually the only part of the kitchen I like!! LOL!! I did the closet doors in my kids rooms. I can leave to do items on them, they can draw and my son and his friends keep score on them. I got the title of "Cool Mom" cause I did it. moi j'ai une porte de placard dans ma cuisine comme cela! wow, I looooove this post!!! Makes me wanna have a wall of it!!! Thank you so much for all these images! These ideas are so creative. We love them so much we recently featured them on our design center blog. Thanks for sharing!